Robert and Donna Hill. RRJ Australian Co Ordinators are excited to announce that Road Riders for Jesus Australia has a New Chapter as of the 1st of December 2015. The Certificate of Charter from Road Riders for Jesus. Carl & Sally Crackel is displayed for all to see. Based in Coffs Harbour NSW, the chapter is looking forward to ministering in the Coffs Coast NSW area. Many of the RRJ members are Working as volunteers with Abundant Life Church in Coffs Harbour who are already reaching over 3250 families thru the Loaves & Fishes store ( all volunteers) who also work with many other NFP organisations in the region. So far the RRJ ministry has been on monthly rides to the surrounding regions up and down the Coast and inland to Dorigo followed by BBQ’s and other food & coffe needs. The RRJ team in Coffs Harbour NSW are looking forward to many opportuntities to minister the word of God and to bring help to those they meet on thier outings. 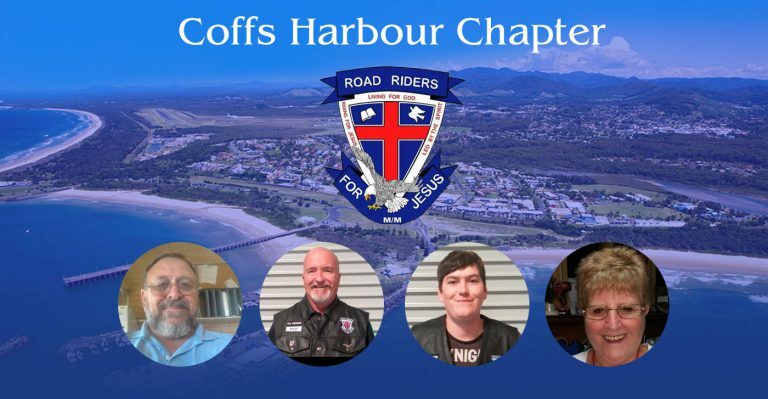 RRJ members Coffs Coast NSW – Chapter 116 are thankful to Robert and Donna for their support and direction in establishing this new chapter and we are looking forward to meeting members of RRJ as we travel.